A cautionary fable from Bruce Sterling. 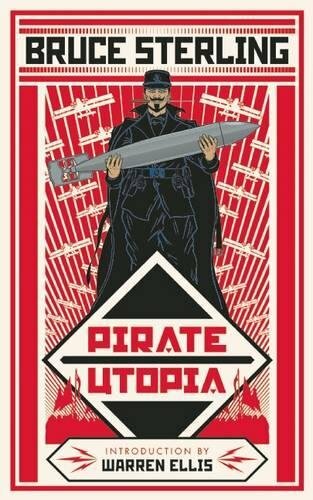 Two questions jump out from Bruce Sterling's intriguing short novel Pirate Utopia. Why did he write it? And does he really mean it? One would like to answer "no" to the second question, but Sterling's track record, not just in science fiction but as a predictor of the future, means he has to be taken seriously. Of all the many science fiction writers now active, he is the one whose commentary on the modern world comes closest to the fictional surface. Sterling made his name as the anthologist of Mirrorshades (1986), the collection which defined "cyberpunk": science fiction about hackers, the 1980s wave of the future. Cyberpunk mutated into "steampunk," a kind of "alternate history" which imagined what might have happened if the dead-ends of Victorian and Wellsian science (zeppelins, steam-powered airliners, clockwork computers) had proved productive. Once again, Sterling was a field-definer through his collaboration with William Gibson, The Difference Engine (1990). His science fiction has continued, but he also branched out into nonfiction with The Hacker Crackdown (1992), Tomorrow Now (2002), and Shaping Things (2005), all books considering the impact of technology. Many see him as the go-to man on what's going to happen next. He has been "Visionary in Residence" at several institutes in the US and Europe; and he is now based in Turin, publishing in Italian under the name of "Bruno Argenti" and in Serbia as "Boris Srebro." He's a very cosmopolitan kind of guy.